We are pleased to announce that we have confirmed the Guest Artists who will be presenting to the students of LGUSD this year — Scape Martinez and Holly Van Hart. Both offer unique insights into the world of art, and are excited to be part of our annual program. Below is some more information about each artist. SCAPE Martinez is an accomplished multidisciplinary artist and writer who has been involved in graffiti art since the 1980’s. 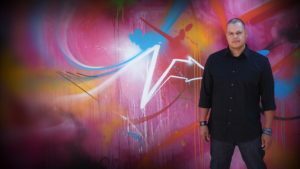 Since then he has pushed the boundaries of graffiti and street art, bringing this urban style into fine art, public art, and the educational arena. Scape’s fine art paintings combine elements of graffiti art and abstract expressionism to create large scale, rhythmic, and expressive compositions that transcend mere technique. Scape Martinez is also an advocate for the arts, frequently doing graffiti orientated workshops and lectures for both teenagers and fellow artists and educators interested in understanding graffiti as an art form. Over the years, his passion for art has transcended beyond walls and canvas to include: public art, writing, and art education. … Scape Martinez is an advocate for art education for young adults, especially in the areas of self exploration and creativity. He works with kids of all backgrounds to help them explore their own language through Graffiti Art. He executes workshops and presents speaking engagements to young adults and professionals alike, sharing his unique perspective on graffiti art and creativity. His insightful, and thought-provoking lectures inform, inspire, and are equally uplifting and motivating. I paint abstract nature paintings that surprise us with unusual colors and textures, and ignite new excitement about a particular slice of nature. I’m absorbed and inspired by the idea of the limitless opportunities we have in our lives. This theme runs through my work. Silicon Valley, in northern California, is the place I call home. Silicon Valley has a really cool culture of creativity and an ‘anything is possible’ vibe.I was raised in New York City by my artist Mom and police officer Dad, and have always loved art. As a girl I painted and did ceramics, crocheting, and calligraphy. Later, while working in high tech, I pursued painting passionately as a hobby – taking many classes, reading hundreds of books, forming an art critique group, and painting every spare minute. 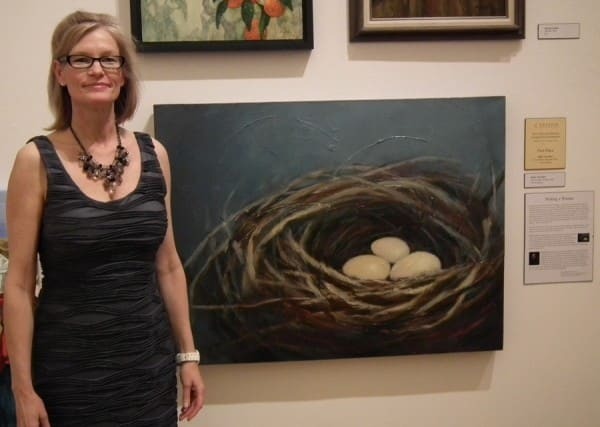 My work is now widely exhibited, and has won awards such as Grand Prize at the California Statewide Painting Competition, Award of Merit at the California Fine Art Competition, and Best of Houzz service award. It has been featured in the Huffington Post, San Jose Mercury News, Examiner.com, Saratoga News, Santa Clara Weekly, KTYM Los Angeles Live Radio, and Silicon Valley ‘Talk Art’ TV.